The Ducks dug deep for their game two victory over UCLA in 11 innings. 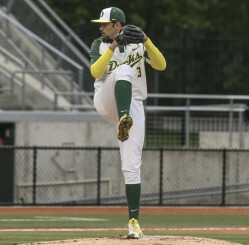 Riding on the wings of a strong pitching performance for the second night in a row, Oregon secured a win in a must-win situation and possibly clinched themselves a playoff berth with the 5-4 win. David Peterson was phenomenal Saturday night against the Bruins. Freshman David Peterson continued to blow batters away, striking out the first two Bruins he faced and fielding an easy grounder to cruise through the first inning. The Ducks put the pressure on UCLA early, loading the bases with two out in the first inning. Mitchell Tolman reached first on an infield single and Phil Craig-St. Louis followed with a hard hit single to center. Scott Heineman continued his solid play, drawing a walk before Brandon Cuddy grounded out to second to end the inning. Little mistakes nearly cost the Ducks the lead in the fifth as a dropped third strike, a wild pitch, and walk loaded the bases for UCLA. Peterson started out the inning strong, picking up his sixth strikeout of the night and forcing Christoph Bono to hit a grounder back to him, retiring the first two batters he faced. The Bruins proceeded to put together a two-out rally, started by a single through the left side by Trent Chatterton. Brett Stephens struck out on three straight pitches, but a dropped third strike allowed him to reach base safely, putting runners on first and second. A wild pitch moved both runners up, and a walk loaded the bases, before Ty Moore bounced back to Peterson to kill the rally. Austin Grebecks triple sparked the Oregon offense. Austin Grebeck got things going for Oregon early in the sixth, blasting the second pitch he saw off the wall in left center for a lead-off triple. Tolman failed to bring him home, striking out for the second time of the night but Craig-St. Louis lofted a sacrifice fly to right, scoring Grebeck and putting the Ducks on top 1-0. The Bruins answered back right away, opening the top of the seventh with a single by designated hitter, Sean Bouchard and knocking Peterson out of the game. Peterson finished the night with 6 IP, 4 H, 1 R, 2 BB and tied his career high 9 K.
Cooper Stiles couldn’t keep the Bruins off the board however, giving up a single and a three-run home run to Stephens, giving UCLA a 3-1 lead heading into the eighth. With a two run deficit, the Ducks went to work in the bottom of the inning, swinging for the fences and seeing it pay off. Cuddy flew out to deep center for the first out, but Daniel Patzlaff reached first on an infield single. Head coach George Horton opted to bring in a power bat, using Shaun Chase to pinch hit for Tim Susnara. Mark Karaviotis gave the Ducks the lead with his first career homer. Chase ripped a double off the left field wall that was inches short of clearing the fence. With runners on second and third, Mark Karaviotis launched his first career home run into the visitor’s bullpen, giving the Ducks a 4-3 lead. 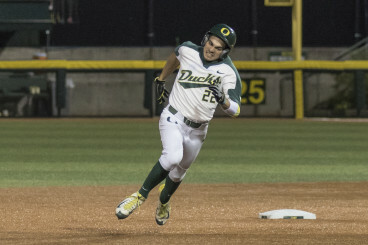 Karaviotis’ first career homer came at the perfect time for Oregon. Following the power bat of Chase, Karavitois told reporters that he benefited from seeing what was coming, “I saw [Tucker Forbes‘] off-speed pitches. I knew the break and I knew in that count I was going to get a fastball,” he explained. 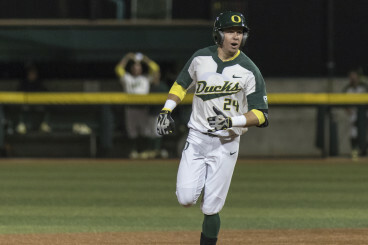 Home runs at PK Park are rare, but everything was working for Oregon on Saturday night. UCLA countered in the top of the eighth, as Stephen Nogosek had another rough night. Chris Keck squirted a double down the third base line with one out, and moved to third on a wild pitch. A walk delivered to Kort Peterson, who was pinch hitting for Bouchard, put runners on the corners for Bono, who hit a bloop single into right, scoring Keck, tying the game for the Bruins. Chase led off the bottom of the ninth and had the entire stadium ready for a walk-off, but the Ducks failed to finish the game in regulation, forcing extra innings. Abandoning their two out rally formula, the Ducks got straight to work in the bottom of the tenth. Tolman reached safely after being hit by a pitch and Craig-St. Louis singled to left-center, putting two on with no outs. Heineman laid down a perfect sacrifice bunt to move both runners forward. With an open base, UCLA pitched around Cuddy in order to attack Kyle Kasser. As Kasser hit a fly ball to shallow left, the game appeared to be over as Tolman tagged up from third on the sacrifice fly. 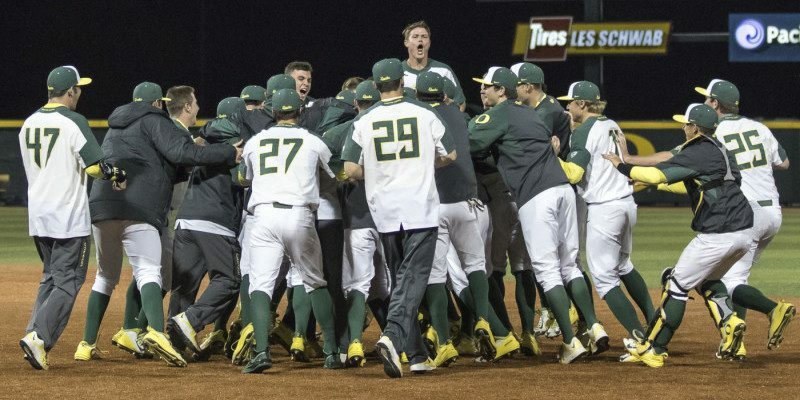 As Tolman reached home and the Ducks came pouring out of the dug-out, UCLA capitalized on a rare mental mistake by Tolman who left third early, doubling him up at third — spoiling Oregon’s celebration. Garrett Cleavinger rebounded from a shaky performance on Friday night, pitching the final three innings, striking out three while surrendering just two hits and no runs. Taking advantage of UCLA mistakes, the Ducks used two hit batters and a walk to load the bases in the bottom of inning no. 11. Phil Craig-St. Louis went 4-5 and hit the game winning single Saturday night. Chase opened the inning by taking a pitch off his side to get on board. Karavitois sacrificed him into scoring position and Jakob Goldfarb –pinch hitting for Nick Catalano – reached base in similar fashion. Tolman drew a walk to load the bases for Craig-St. Louis, who put the game away with an RBI single to right, finishing the marathon game before an early return to the park for a 12 p.m. game Sunday afternoon. 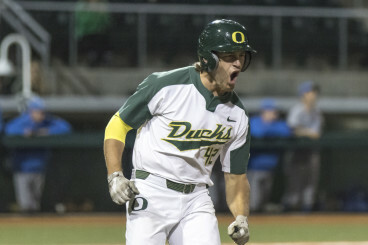 The victory was an important one for an Oregon team that has showed incredible resilience over the last month of the season, winning 11 of their last 15 games, helping them make their case that they belong in the College World Series playoffs. Sunday’s game will be the final hurdle to clear before their fate will rest solely in the hands of the playoff committee.